What with the upheaval around the house, the summer heat and a knitters wrist giving me grief, things have really slowed down on the knitting front around here… I’ve found myself getting a bit anxious about that, partly because I have some samples I really want to get made for classes but also just because the knitting of a few rows is normally so much a part of my day! But all things ebb and flow, I guess. I am also aware of how the need to get things done for classes can get stuck in the back of my head and take a bit of the joy out of the process if I am not careful. 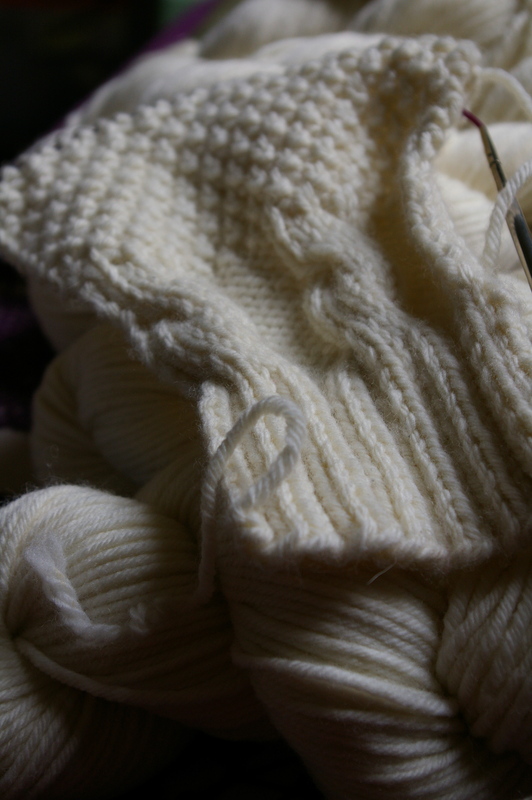 So I am reminding myself why I both knit and teach… for the joy of it- it is hardly work! And that whatever I get done for the classes will be enough. Then, happily, I was delivered some inspiration this week! The ton of wool project has begun yielding its fruit and I received my 1.5kg of yarn… and man, is it beautiful! So soft and light, with a beautiful, soft lustre and the kind of elastic spring you normally only see in handspun yarns. Kylie opted to make mostly worsted-spun 10-ply this time around (although I do believe there is some 4-ply floating around) and I was really interested to see what it would be like spun as a smooth worsted yarn, rather than the lofty, woollen-spun elsawool Cormo yarns that I’d seen before… I remember my spinning teaching saying that a fleece will tell you how it should be spun and my instinctive response to Cormo is woollen! In fact, the choice was made for Kylie by the current absence of mills able to produce woollen-spun yarns here in Australia (something in the process of changing with the development of the Yass Valley Woollen Mill) but now, having started to swatch with the yarn, I am eating humble pie! Yes, I still think that the airy fluffiness of Cormo would be best displayed in a woollen-spun yarn but this yarn has the great stitch definition and lustre of a good worsted-spun yarn. If it can be processed for different uses, even more reason for a greater appreciation and use of our own Australian Cormo! Kylie, I take my hat off to you for getting this going! I was thinking I’d make an old-school aran cardigan with it… and then, the second source of inspiration arrived- the new collection from the ever-classy Brooklyn Tweed. So many lovely designs that strike a great balance between an interesting knit and an immensely wearable garment. And this one jumped out… I really love the shape and the collar and other details but not the cable. So playing around with whether I substitute a similar intricate, ropey cable that sequences well with the deep 2×2 rib or whether I can use a series of the simple linear cables and honeycomb pattern that I love so much. Thoughts? And what are you planning to do with your Cormo?! This entry was posted in community, knitting and yarn and tagged cormo, ton of wool on March 25, 2012 by admin. I put my name down for 300g so am thinking of the herringbone cowl! I wonder when I will get my yarn!? Oooh… is it ready?? How exciting. I have NO IDEA what I’ll do with mine but I’m wanting to cuddle those swatches of yours! It’s really useful seeing a swatch of the Cormo knitted up. The stitch definition looks really good, I’m looking forward to getting my mitts on some. I don’t really know what I’ll do with my lot of yarn. I’ve been kicking around a few ideas in my head of what I could do; one pattern I had in mind was Ashby by Leila Raabe (http://www.ravelry.com/patterns/library/ashby). If I bought more Cormo, I’d consider an Aran jumper too, or something a wee bit different, like a version of the jumper worn by Paikea from Whale Rider… It’s a yarn with a lot of potential, obviously! that looks so snuggly! What a lovely jumper it’ll be!